Mini air gate LS PLE  the mini unit with the maximum effect. The midget among the HAUG air gates, it nevertheless offers top effectiveness combined with the smallest dimensions. 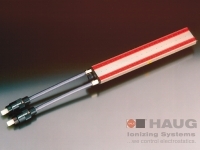 Two rigidly installed ionizing bars with circular jet nozzles guarantees the best performance. 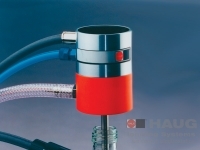 The handy unit is particularly suitable for use with smaller machines. The Duo air gate LS GK, together with its simultaneous dusting of non-conductive surfaces, is a highly developed and efficient aid in the removal of electrostatic charges.The device reduces negative impacts on production so that quality losses, as well as high numbers of rejects, can be almost completely eliminated. This reduces production costs considerably. The Compact Airlock KM GK is operated in the medium pressure range. This technique reduces operating costs significantly, without sacrificing effectiveness. 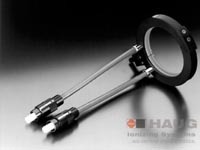 In combination with a HAUG Ionizing bar a good surface for subsequent coating of plastic parts or other pre-treatment processes can archived. 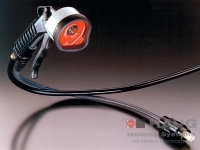 The Needle ionizer NI generates positive and negative ions. 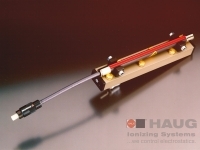 The units assist the air stream and is intended to eliminate electrostatic charges and contamination (e.g. dust) from small and tiny vessels. 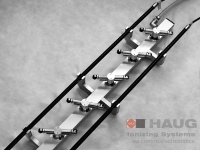 Extensive trials have confirmed that the ring ionizing unit EI RIF is the special piece of equipment for the elimination of electrostatic charges during granular product conveying (Ring ionizer in feed pipes). 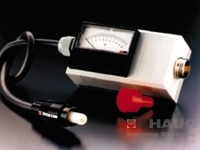 Even extremely high static charge potentials are neutralized reliably and highly effectively. A steady, problem-free and efficient production process is therefore guaranteed. 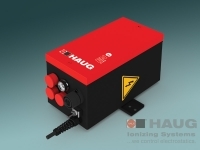 The HAUG ring ionizer is a highly effective production aid for the discharging and cleaning of surfaces  in particular of non-conductive materials. 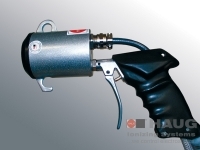 Beside the hand-held unit, other versions are available for installatin into plants and machinery (without air gun). 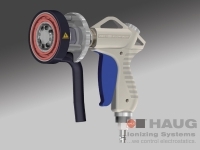 The HAUG RI LG Lady Gun ionizing air gun has its name with good reason: this ionizing device, with its service-friendly handling, is a peerless innovation in the field of elimination of dust and charges. Heavy-duty users and women greatly appreciate is lightweight. 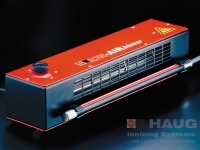 The Ion-Air one IR1 low-pressure blower is a versatile device for the elimination of electrostatic charges on non-conductive material. 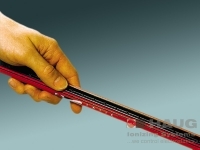 An airflow, enriched with either positive or negative ions, neutralizes interfering surface charges and removes  depending on the working distance  debris from the surface.The Ion-Air one does not need compressed air. Room air is drwan in, filtered, accelerated by the fan, and then simultaneously ionized and blown out again. 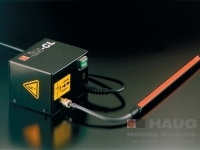 HAUGs Ion-Air blower IB is based on the concept of a proven ionization technique. 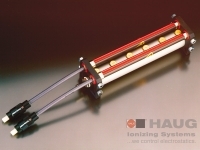 Negative and positive ions are added to the air flow produced by a cross-flow blower. 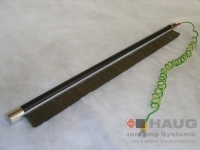 The air flow hence becomes conductive and is able to eliminate electrostatic surface charges on non-conductive material. 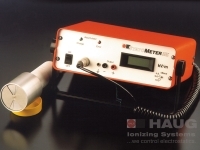 The HAUG air ionization blower Ion-Air mini is a small, lightweight unit which is operated at a voltage of 24VDC. 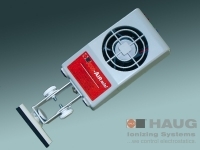 The Ion-Air mini is supplied with a clamp which allows the unit to be fixed very easily in the desired position, for example at a table edge. When the clamp is removed, the Ion-Air mini can be used a handy table-top unit. Delta blower DA TR  small design  great effectiveness! Its compact design makes the Delta blower DA TR a very versatile device. Its wide, cone-shaped air jet blows accross the ionizing pins which generate a vigorous ionic current with positive and negative ions. 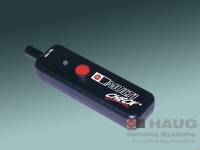 The Mobile Circle Cleaner is a hand-held ionizing unit. 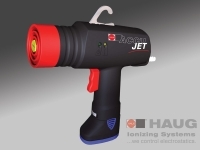 It eliminates electrostatic charges and adhering dirt in one work process. The Mobile Circle Cleaner is particularly effective on textured surfaces. 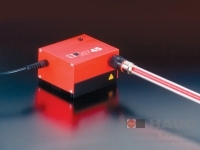 The compact surface cleaning unit Circle Cleaner CC 01 allows electrostatic charges to be reduced or eliminated by means of a rotating compressed air nozzles.A special variable-speed cleaning nozzle with pulsating air flow and twin nozzle with a unique working principle ensures, depending on the operating distance, that disturbing surface charges and contamination are eliminated. These Web Cleaner 1 WXC 1 are used for removing dust from surfaces. 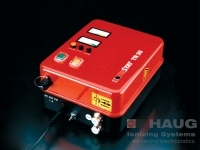 The functional modules consist of ionization, air jet and extraction. These modules are coordinated effectively within a closed system. 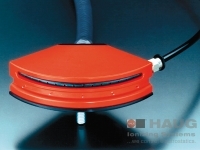 The HAUG Surface Cleaner is intended for the contact-free removal and cleaning of electrostatic charges and particles from, for example, plastic injection mouldings, deep-drawn parts and film webs. 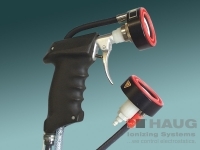 The combination of two (round) ionizing bars and pulsed compressed air from several rotating cleaning nozzles ensures a consistent, efficient cleaning result. 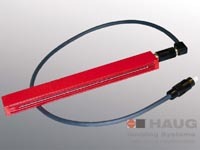 The HAUG charging bar ALS is suitable for most applications where material webs are to be fixed relative to each other. 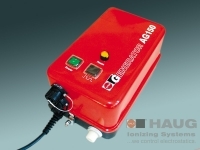 The charging bar ALS can be supplied using a HAUG AG-series charging generator. These are optionally available with positive or negatice polarity. 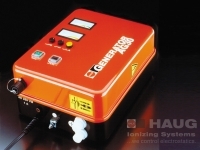 The voltage of the charging generator can be steplessly adjusted. The charging generator AG 25 is equipped with one high-voltage connection (DC). The electronic voltage adjustment is stepless, and there is a choice of analog or digital display integrated into the unit for the output voltage. This unit has been tested and proven thousands of times. It is suitable for all common applications. 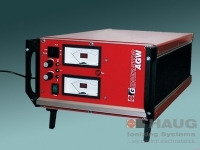 Beside its two high-voltage connections for the charging section, the charging generator AG 35 also offers a discharge section with four high-voltage connections and electronic fault and performance monitor. 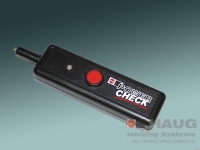 The electronic voltage adjustment is stepless, and there is an analog voltage output display integrated into the unit. 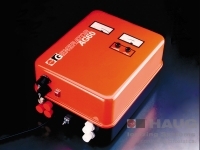 The charging generator AG 60 is a high-voltage generator which is used in combination with HAUG charging electrodes and a suitable counter-electrode. 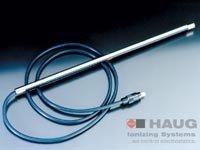 The charging electrode must be attached at a distance of 1020 mm above the material to be charged, exactly opposite the counter-electrode. 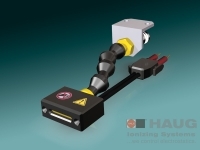 HAUG charging systems are intended for the contact-free application of electrostatic charges. These systems are used wherever different materials need to be fixed to one another electrostatically. This electrostatic fixation is intended to support downstream processes such as the film overlap in packaging machines. At least one of these materials must be insulating. 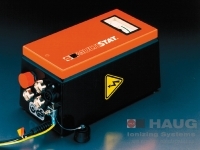 The HAUG charging generators Tristat TR 15 / TR 25 are high-voltage generators developed specifically for the supply of HAUG charging triodes (types ALT, ALM and ANT). The charging triode is placed at a distance of approx. 1020 mm above the material to be charged, directly opposite the counter-eletrode. 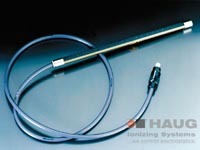 The earthed counter-electrode must be in contact with the material to be charged. 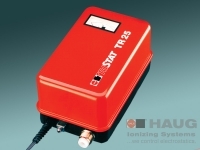 The Tristat TR 30 charging generator is a high-voltage generator which was specially developed to feed type ALM triodes. The current threshold of this device can be adjusted. The output voltage can also be controlled. An analog display shows the current and voltage. The device has two high-voltage terminals for the connection of ALM, ALT or ANT charging triodes. 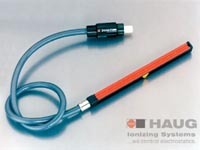 HAUG charging triodes are characterized by a very homogenous field around the charging pins. Due to the special geometry of the charging triode, no spark-over to the counter-electrode can occur. 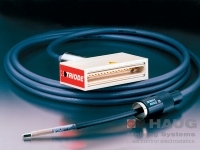 The charging triode can therefore be mounted at a distance of approx. 1030 mm from the material to be charged. 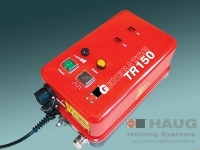 The supply to the charging triodes is from the charging generator TR 150 which is available with either positive or negative polarity. 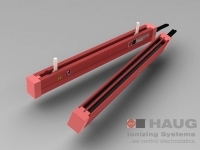 In combination with the connected direct voltage ionizing units, the EN 1 DC provides a high discharging output for the neutralization of electrostatic charges. 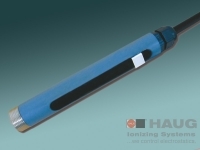 It therefore ensures reliable electrostatic neutralization even in fast running processing. 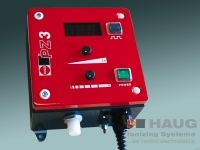 Power pack EN 92 Ex is suitable for direct use in areas with potentially explosive atmospheres (zones 1 or 2).The units comply with the European ATEX directives. 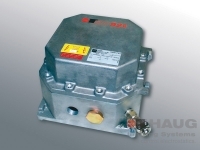 All high-voltage components are accommodated in a flameproof housing. 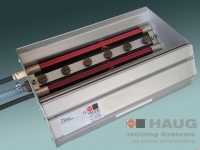 The design of the ionizing bar EI Ex T complies with the European ATEX directivities. In combination with the power pack EN 92 Ex or Multistat Ex, it is suitable for use in manufacturing locations with potentially explosive atmospheres resulting from gases of explosion group IIA, temperature classes T4 to T6. 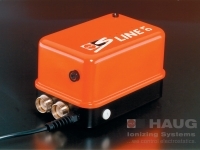 Units for areas with potentially explosive atmospheres (ex zone). 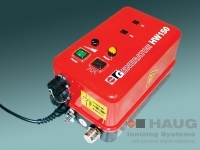 The ring ionizers RI EX M/V are supplied as a hand-held unit (RI Ex M/V) with compressed air gun, or for fixed installation (RI Ex O). Due to their compressed-air assistance, these units are ideally suited to blowing off workpiece surfaces using ionized air. At the same time, electric charges on non-conductive materials can be eliminated in one process. 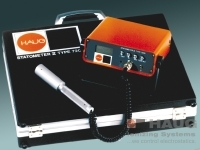 The HAUG Compact-Line offers a package of ionizing technique at a reasonable price. 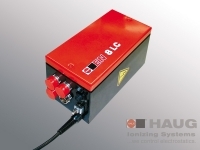 Small and easy to handle, the EN CL power pack has a modern layout and is highly efficient. 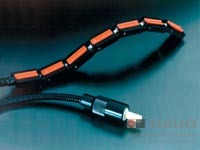 This power pack is equipped with a high-voltage connector (connectable length 5 m). 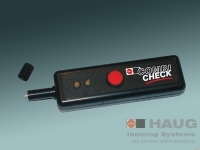 The EI PRQ ionizing bar perfectly complements the power pack EN CL. 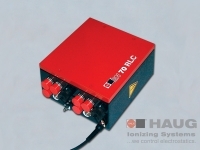 The EN 8 LC power pack represents the state of the art. 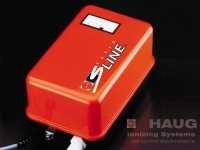 The monitoring which is integrated in the secondary area indicates that the partial discharge inception voltage (= start of effect of ionization units / ill.1) is too low by making the monitoring LED blink. 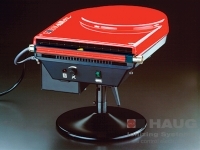 The compact printed circuit board technology ensures reliability and ease of maintenance. 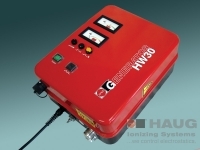 The device has four gas-tight high-voltage connections and has been manufactured in accordance with protection type IP 54, protection class I as per VDE. 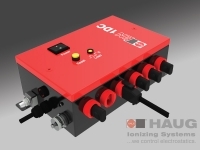 With his modular electronic components the EN SL power pack guarantees a service-friendly power supply.The EN SL power pack comes with two high-voltage connections and was designed to provide HAUG ionizing systems with the required voltage. 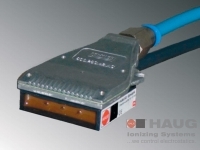 The combination of power pack NF 45 and ionizing bar NFA was developed specifically for use on fast running machines. 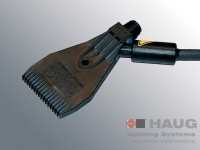 The power pack NF 45automatically adjusts the discharging frequency (400  800 Hz) to the connected bar length. The higher frequency of the power pack NF 45ensures a high decoupled current and therefore fast, even discharge of the material. Still, the ionizing bar NFA is absolutely safe to touch. 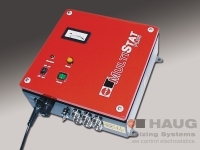 The Multistat power pack in combination with HAUG ionizing units is intended for the removal of electrostatic charges. 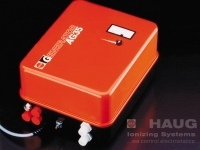 The mains voltage is transformed by the Multistat to an output voltage of 7  8 kVAC for the operation of HAUG ionizing units. 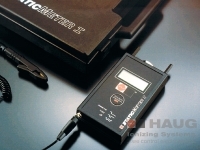 The high-voltage power pack Multitstat Plus with its long permissible connected length and extended monitoring facilities is a high-performance unit. 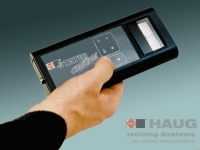 The Multistat Plus is particularly suited to systems with multiple ionizing bars. The extended functions of the Multistat Plus allow improved monitoring of the ionizing system set-up with this unit. 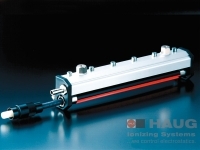 Thanks to its state-of-the-art ionization technology, the HAUG EI SL ionizing bar is setting new standards: Ensuring an optimal neutralizing effect, it eliminates electrostatic charges during roll, sheet and web processing. 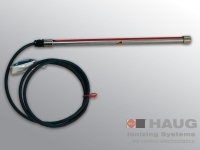 The HAUG EI RN ionizing bar is a powerful and rugged piece of equipment. Its construction satisfies all technical requirements and it has proven its value repeatedly in the removal of electrostatic charges during roll, sheet and web (continuous product) processing. Production interfering surface charges can be removed reliably and effectively  even at high operating speeds. 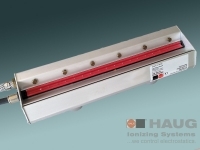 The HAUG ionizing bar EI VC reliably eliminates electrostatic charges in clean rooms. It can be used in both directly for the discharge of objects or for enriching laminar air flows with positive and negative ions. 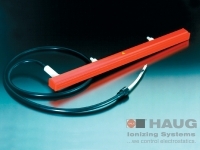 The HAUG EI VS ionizing bar reliably removes electrostatic charges and its performance, when compared to the standard version, is considerably enhanced. The version EI VS Nut is equipped with a continuous T-slot. 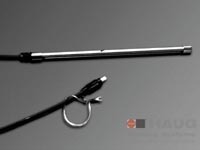 This allows the bar to be mounted without additional brackets with minimum mounting effort und greatest possible flexibility in the choice of fastening points. 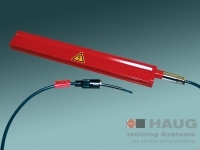 The HAUG ionizing bar EI HRN is intended for applications in temperatures up to +130°C. 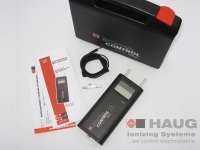 It is a powerful ionizer symmetrically generating positive and negative ions by means of alternating voltage. 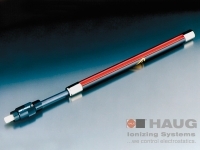 The HAUG ionizing bar EI PS is a mini high-performance ionizer. 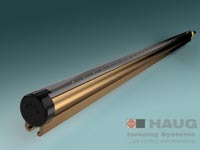 Thanks to the power technolgy developed by HAUG, its operational effectiveness is clearly above other comparable ionizing bars. A particular advantage lies in the symmetry of the emitted ions: positive and negative particles approach the load carrier absolutely uniformly to give contact-free neutralization. They ensure reliable elimination of spot charges. 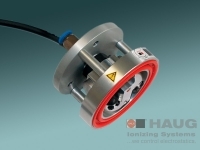 The HAUG segmental ionizer EI Form has proven its value in the removal of electrostatic charges in the packaging industry and in the medical technology. 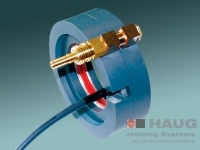 Production-interfering surface charges can be removed reliably and effectively with the EI Form. 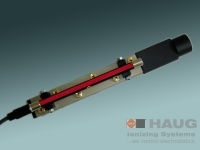 The brush ionizer (BI) is a passive ionization bar and reduces static charges with very high field strengths on material webs  preferably case in combination with an active ionization system.